“American Tapestry In Poem” from Christian Faith Publishing author Beverly Hembrecht is a collection of poetry that takes readers on a historic journey. Through the power of poetry, readers will take a nostalgic trip into the shared history of America. “American Tapestry In Poem”: a poetic journey to remember and reflect on the past. “American Tapestry In Poem” is the creation of published author, Beverly Hembrecht. Beverly has been writing poetry since she was twelve years old. She would write on an envelope, a napkin, a paper bag, or whatever else was handy whenever she felt inspired. If she does not write her thoughts down immediately, she will lose the rhythm of the poetry. Once she even jumped right out of the shower to write a poem. Beverly and her husband, Bill, have been married for 43 years. They even finish each other’s sentences. She loves to quilt and crochet as well as garden. Bill has inspired much of her writing and encourages her in all things. She has two children, two grandchildren, and three great-grandchildren. She feels very blessed. She also makes great apple dumplings and pies. Published by Christian Faith Publishing, Beverly Hembrecht’s new book of poetry offers thought-provoking, humorous, and nostalgic verse for lovers of poetry and history. The poetry within the pages of “American Tapestry In Poem” takes readers into the past where they will reminisce about the happy, as well as sad, moments of history. It then brings readers back home to reflect on interesting events ingrained in the memories of all. 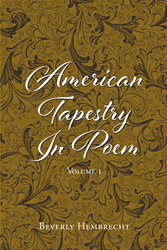 Many of the poems featured in “American Tapestry In Poem” have been published in Europe and Canada as well as the United States. Many have also been recorded in the Sound of Poetry. Several of the Christian poems appeared in The Poet’s Pen magazine. The poem “For Those Who Pray” appeared in the Lutheran Digest. View a synopsis of “American Tapestry In Poem” on YouTube. Consumers can purchase “American Tapestry In Poem” at traditional brick & mortar bookstores, or online at Amazon.com, Apple iTunes store, Kobo or Barnes and Noble. For additional information or inquiries about “American Tapestry In Poem”, contact the Christian Faith Publishing media department at 866-554-0919.